Two of the three ex-Lothian open top Olympian buses have been exported to Hungary in readiness for sightseeing work this summer in the capital city, Budapest. E303MSG and E304MSG made the journey to Hull and then by P&O ferry to Zeebrugge, before the 1,000 mile road trip across Belguim, Germany and Austria. They arrived in Budapest on Sunday 19 June and are now being resprayed in the sightseeing operators' colour scheme. 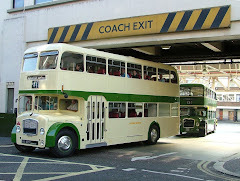 Both buses were fitted with offside platform doors for European use by the BusWorks before export.